PQ's in Asakusa, Tokyo, is known for its art-like, photogenic curry, cooked with colorful spices and ingredients. The menu is all-vegan and vegetarian and includes ramen and other playful dishes. As an LGBT-friendly cafe, all diners are welcome here. Visitors coming to Asakusa to enjoy the shrines, temples, and traditional shops should visit PQ's for a lunch break to indulge in curry and rice that comes in a rainbow of colors, from pink and blue, to everything in between. The menu at PQ's is vegetarian and vegan, ensuring that diners can enjoy delicious and healthy food regardless of dietary restrictions or preferences. This is also an LGBT-friendly space where all visitors can feel comfortable. Started in 2018, PQ's is a restaurant a 8-10 minute walk north of the famous Sensoji Temple in a quiet residential area. The restaurant's owner originally began to make art-like, vegan curry in Shinjuku's Golden Gai, a restaurant and entertainment district. The curry became popular, resulting in PQ's opening. The curry and rice is colored naturally with various spices imported from throughout the world (as shown above). The eye-catching designs are very popular, and receiving attention from Japanese celebrities on Instagram. Ramen, pasta, dessert, and adult beverages are also offered on the menu. The charming table setting at PQ's. Stylishly decorated, the restaurant was remodeled completely with recycled and collected materials and furniture by the owner. The lighting is dim inside, creating a cozy atmosphere that makes visitors want to linger. As an LGBT-friendly space, PQ's welcomes all guests and aims to make all customers feel comfortable, regardless of their sexual preferences or identity. The environment is open and supportive, and the friendly staff chat with diners. The most popular item on the menu is the curry and rice set, which comes with an appetizer (1,200 yen including tax). As the menu is seasonal, the ingredients, color, and design of the dishes change regularly, adding to the excitement of ordering. Pictured above is the appetizer, which contained a carrot marinade with shiso leaf, two types of tofu, and a tomato saute. The silken tofu was seasoned with refreshing yuzu, a citrus, and flavorful kelp. Like the appetizer, the curry is different every day. Shown above is a coconut milk-based curry with sweet potato, turmeric, and spirulina. The designs on top of the curry are made with black sesame paste, and the red accents are pink peppercorns. The design of the curry and rice changes every day. PQ's will make pink, red, and even blue curry depending on the spices and condiments in stock. The restaurant also offers a ramen menu on Fridays and pasta daily. Pictured about is the tonkotsu ramen (900 yen including tax), which typically contains broth extracted from pork bones. This version is vegetarian and vegan, made from all vegetable-based ingredients. There are also gyoza (Japanese pot stickers) and karaage on the menu--two items that are frequently enjoyed with ramen in Japan. The gyoza (400 yen including tax) is stuffed with vegetables and tofu, and the karaage (300 yen including tax) is made with soy meat. Pictured above is a creamy Aurora sauce, made with ketchup and vegan mayonnaise. In addition, there is pasta is on the daily menu (1,000 yen including tax). Shown above is a vegetable-filled pasta with mushroom, cabbage and beets, making it a great option for guests who want a tasty and nutrition-filled meal. PQ's has a drink menu that includes out-of-the-ordinary beverages, like oat milk, turmeric lattes, and local Japanese craft beer. Pictured above is the oat milk (400 yen including tax), made in-restaurant, flavored with vanilla and maple syrup. The drink has a mildly sweet, satisfying aftertaste. Oat milk is not common in Japan or in Tokyo, making this a rare non-dairy treat. Guests craving something sweet should try the dessert menu. The desserts change by day and season. Pictured above is a parfait with strawberries (400 yen including tax), mixed berries, a cereal layer, and chia pudding. Be sure to mix up the parfait to fully enjoy the different flavors and textures of this mildly sweet, light dessert. PQ's is located in a neighborhood known as Oku Asakusa. After arriving at Asakusa Station, go first to Sensoji Temple. Head north on foot for around 8-10 minutes from the temple to reach the restaurant. PQ's is on a street lined with houses and small restaurants. Its exterior blends in with the residential neighborhood, so look for the sign out front when looking for the restaurant (the arrow above points to the entrance). This is a welcoming restaurant with a nutritious, delicious menu with stand-out curry and other lovingly-made dishes. The owners and employees at PQ's are also warm and strive to welcome all customers and create a friendly community. 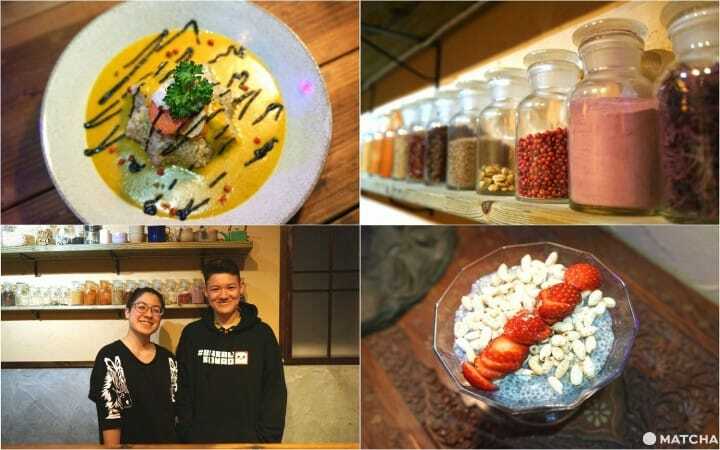 If you are craving vegetarian and vegan food, or just a place to relax and be yourself during a day of exploring in Asakusa, look no further than PQ's.